→Bourgeat 13 Piece Copper Cookware Set Review – Should I Buy ? If you are lucky enough to have a large budget to spend on a brand new cookware set, then you should definitely splurge out on classic copper. Copper is a fantastic conductor of heat and the absolute queen of cookware in any kitchen. As well as being the absolute best metal to cook in, you also cannot escape the fact that copper looks nice, really nice. After all, many people have copper pots in their home simply for decoration. If you are wanting to buy a copper cookware set then below you can read our Bourgeat 13 Piece Copper Cookware Set Review. The following are the most features and specifications of Bourgeat 13 Piece Copper Cookware Set. This cookware is made from extremely thick red pure cooper, it is 2mm in thickness. This is then sandwiched in between layers of 18/10 stainless steel that is highlypolished. The insides of the pots and pans are as highly polished as the copper exterior. Copper is a fantastic conductor of heat which means that food is thoroughly cooked with no hidden hotspots. Allowing for professional grade cooking, there is also the added benefit of easy cleaning and maintenance, as copper will not warp or easily tarnish. The interior of these pots and pans are made from highly polished stainless steel. This ensures that the cooking surface is incredibly smooth and safe for cooking. Stainless steel will not interfere with the taste of food or be easily stained. One huge benefit of polished stainless steel interiors is that they are pretty much nonstick, although not advertised as such. You use much less oil when cooking so it is a healthier way of cooking and food ultimately cooks much quicker. It will also not burn and is the perfect environment for searing meat. Having stainless steel interiors also means that they will not need to be re tinned later on in life. When considering the many features of a pot or pan one important feature that must not be overlooked is the handle. 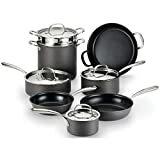 This cookware set has handles that are incredibly sturdy and well made. Comprised of cast iron they are smooth to the touch, long and easy to hold. As they are made of cast iron they also stay relatively cool when sat on a hot hob. All of the handles are enforced onto the side of the cookware with heavy duty rivets. What these handles also do is to counterbalance and steady the weight of the pan, ensuring that it stands sturdily and will not easily be tipped over. 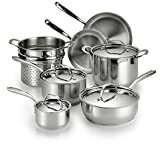 This cookware set comprises of the following: a large casserole pan; a copper sauce pan; 2 copper saute pans; a Brazier and 3 differently sized frying pans. The set also features 5 copper lid inserts. The set features everything that you will need for everyday cooking as well as on those special occasions. All pans feature a drip proof rim for easier pouring, saving on spills and splashes. This also makes the cookware that much safer to use. The set comes with 5 differently sized copper lids. Each one is designed to sit snuggly on its corresponding pot or pan. The fit is particularly snug allowing a tight seal. Food is therefore heated up much more quickly and stream is not allowed to escape. It also ensures that nutrients are sealed in while cooking. Although incredibly strong, the lids are very lightweight and easy to lift on and off the pot with their easy to grip and stay cool handle. Matfer Bourgeat COPPER FRYING PAN 11"
Q. Can this set be used on induction hobs? A. No this cookware can be used for any other type of cooker, but not induction. 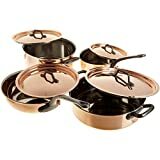 The Bourgeat 13 Piece Copper Cookware Set Review is for the serious cook at home who wants to invest in high quality cookware that will last a lifetime. This copper cookware set is polished beautifully, cooks efficiently and evenly and is very easy to clean. If you do have a large budget into which to buy cookware at the top end of the market, then copper is always good to invest in. This copper cookware set does not disappoint.